You’ve traveled halfway around the world to a land so vastly different to anything you’ve ever experienced. The culture, the language, the food so different to anything you know. This nervous tension is what drives your travels, the exhilaration of trying new things, mixing with locals and discovering something new. 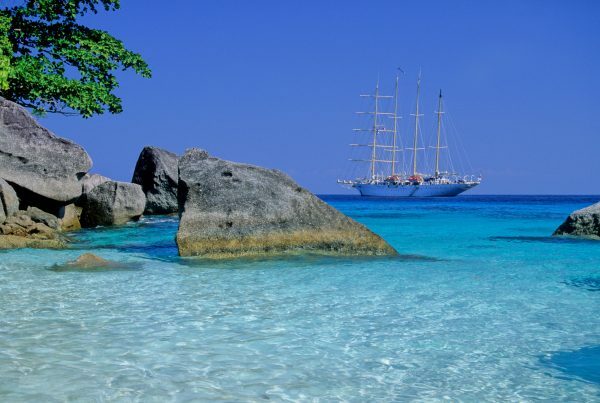 You find yourself in Bangkok, the vibrant bustling capital city of Thailand. 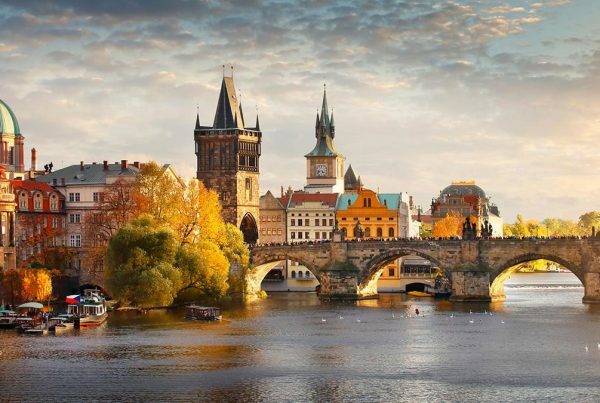 A city with over 8 million people and you’re hungry for dinner. What’s the best way to hit this challenge head on? 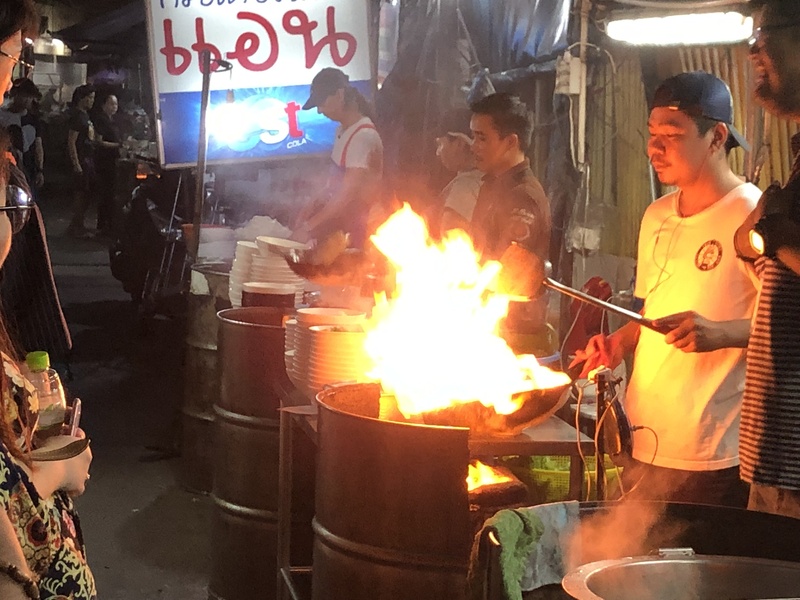 A food tour of course, and Bangkok Food Tours has the answer: Bangkok’s Best Eats Midnight Food Tour by Tuk Tuk. Our Southeast Asia Bucket List Experience 2019 starts in Thailand. We arrived late evening the night before, 24 hours of flights and layovers had us thoroughly exhausted. Unrelenting we pressed on, after a good night’s rest we woke early to explore Bangkok’s many temples. Our game plan was to take advantage of the comparatively cool morning, rest again in the afternoon before hitting the streets that evening. We booked the Midnight Food Tour by Tuk Tuk offered through Bangkok Food Tours. Hopping a cab to our meeting point we rendezvous with our guide, Ronnakorn Suriyamongkol who thankfully goes by the name of Ron. Bangkok Food Tours employs a stable of capable guides, but I have to say our guide Ron was a perfect fit for our group. He knew his stuff, was thoroughly entertaining and continually engaged his audience. 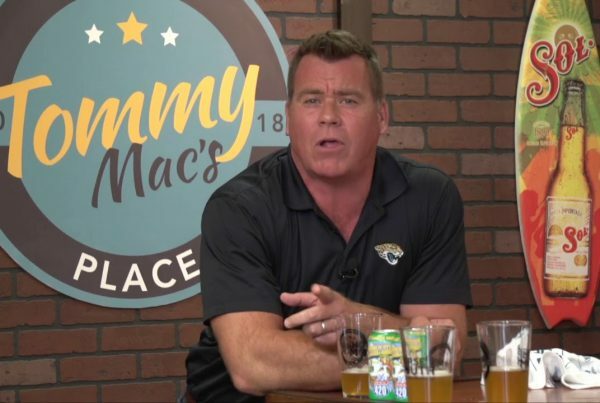 Ron had lived in the San Diego area, still follows the NFL, and appreciates a good beer… my kind of guy! Always the comedian, he kept us entertained between food stops and diligently described the meals we were about to eat. I should mention the mode of transportation for our tour is the Tuk Tuk (pronounced took took) If you are not familiar with this remarkable vehicle, I want you to think rickshaw. The original version was two-wheeled and pulled by a human, today they are motorized with 3 wheels. A scooter on the front with a carriage on the back carrying 2 to 4 guests plus the driver. Tuk Tuk drivers have the uncanny ability to maneuver through traffic with Zen-like dexterity, which makes for a quite interesting ride. We had a group of 12, including Ron each paired in their own vehicle, in a Tuk Tuk caravan traversing the streets of Bangkok. As I climbed into the Tuk Tuk I contemplated the significance of Bangkok Food Tours including complementary basic medical insurance with our food tour booking (nervous laugh). 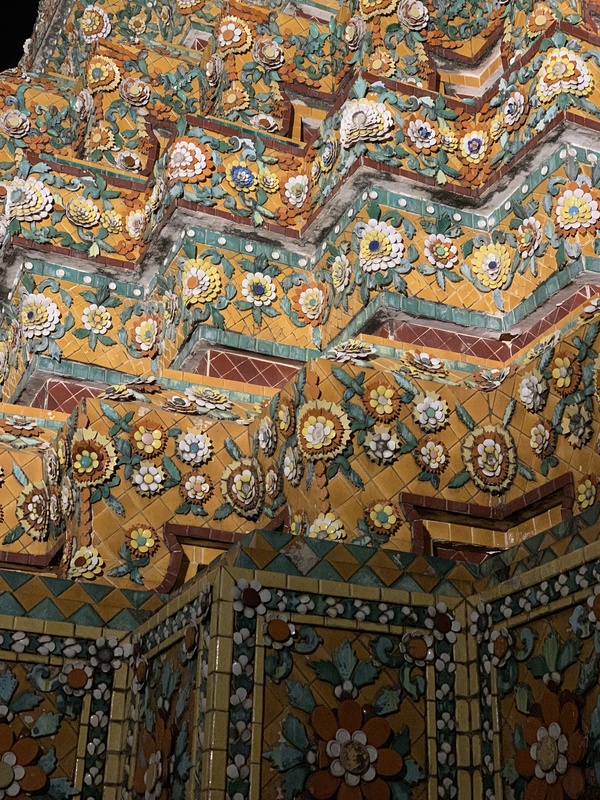 Our Tuk Tuk caravan zips through the streets of Bangkok following an interesting itinerary that includes several restaurants, a beautiful temple, a flower market, and a special bar with an amazing view of Wat Arun. As for the food, I guarantee you will not go hungry. I’m talking full-size portions, not small plates. With several restaurant stops, each a local’s favorite with a wide variety of foods to explore and discover. 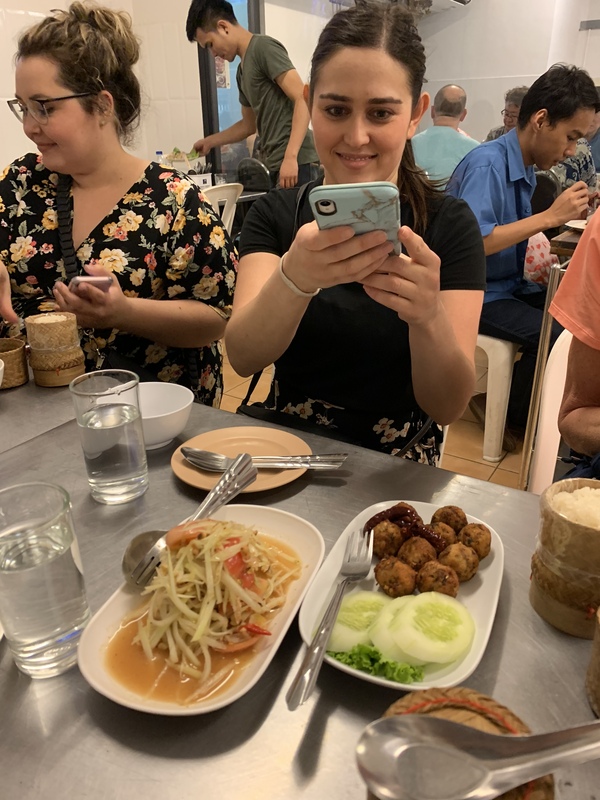 We ate family style at our first stop sharing huge portions of spicy papaya salad, delicious meatballs spiced with kaffir lime, and an amazing Tom Yum soup. Also included, was larb, a dish from Northern Thailand made from ground chicken seasoned with traditional Thai spices including kaffir lime. Walking through our 2nd restaurant to an alleyway we found a line of chefs cooking over an open fire. Ron described the cooking technique while explaining our next meal, a delicious fried noodle dish with chicken and pork topped with an egg. This was a full dinner serving, and we still had more to go. Our 3rd restaurant was the famous Thipsamai, known for making the Thai national dish, Pad Thai. Each guest served a full plate of a delicious mixture of rice noodles, egg, tamarind, garlic, bean sprouts, peanuts, and shrimp. We had a choice of either the original recipe or the modern version. We ordered one of each and shared but found the original to be more to our liking. One common trait of Thai cuisine is each dish offers an interesting combination of tastes and textures. More specifically you’ll find sweet matched with sour and spicy Texturally, soft noodles with crunchy peanuts and bean sprouts. It makes for a very interesting combination that I found to be delicious and very appealing. Intermingled with our restaurant stops were visits to the Pak Klong Talad Flower Market the largest flower market in Bangkok. 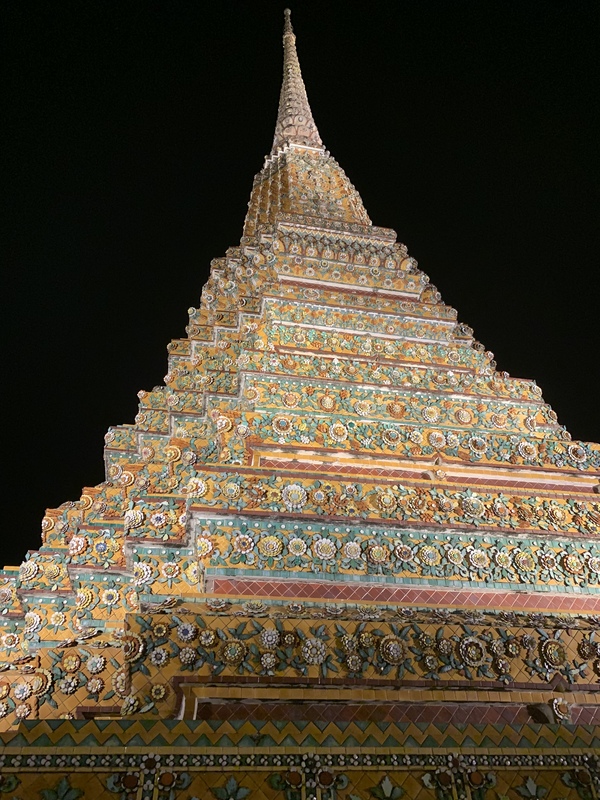 A remarkable visit to Wat Pho, illuminated at night and totally void of tourists. It was so nice to have the temple to ourselves especially after seeing it jammed with tourists earlier in the day. Ron pointed out the intricate details and gave us a historical perspective of everything we saw. We visited numerous street vendors offering both sweet and savory delicacies. 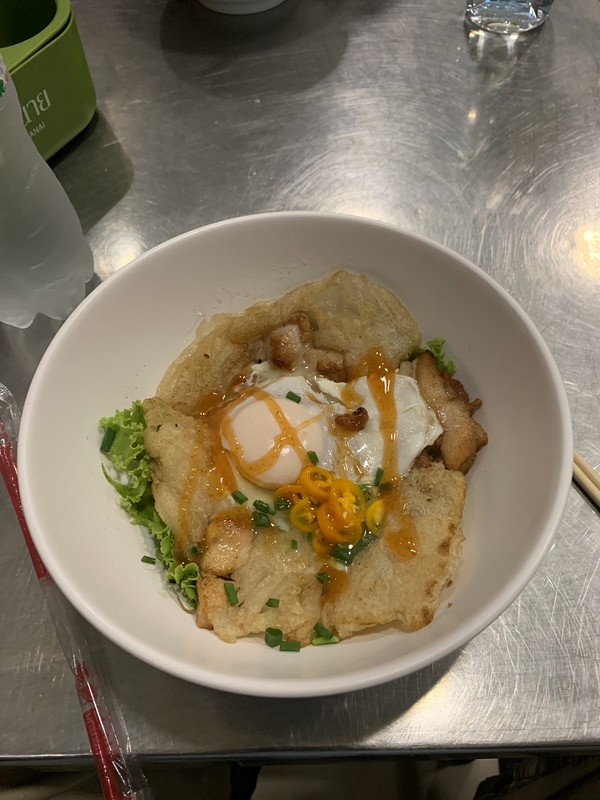 We tried bar-b-que pork and chicken satay, and a unique Thai crepe dessert that resembled a taco. 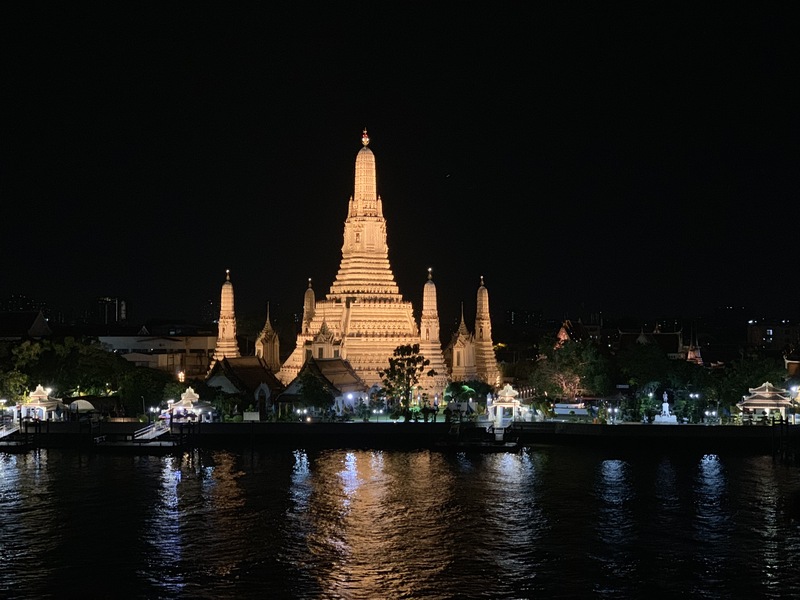 The last stop of the evening provided an incredible nighttime view of the illuminated Wat Arun (article header picture) located on the opposite side of the Chao Phraya River. A rooftop view from their “secret bar” which coincidentally was at the top of my “must do” list for Bangkok. We sipped our complimentary ice-cold Singha beer, enjoying the view while chatting with our guide, Ron. As the clock approached midnight, we were returned to our hotel by our personal Tuk Tuk. We enjoyed our experience, Ron was the perfect guide on this very entertaining food tour. The cost of the tour was 2050 Baht or about $65 per person, a reasonable cost for an entertaining evening with lots of great local food. 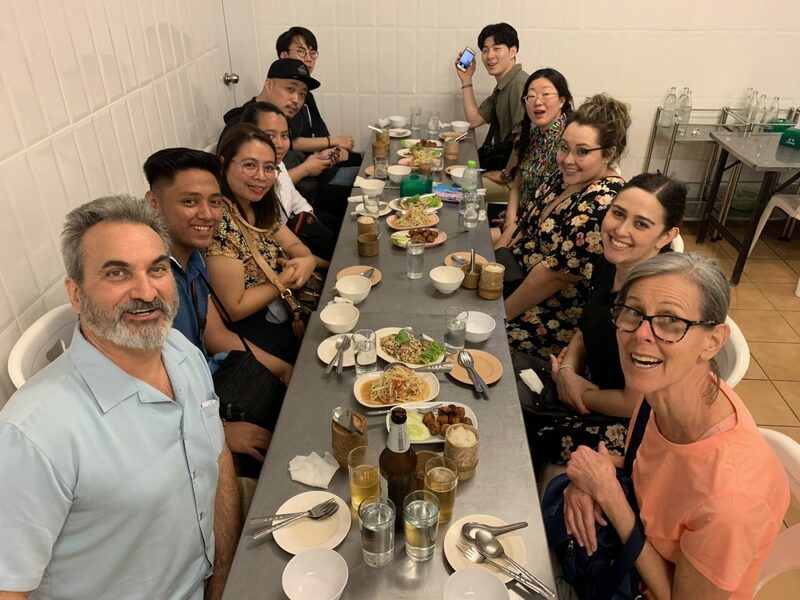 Bangkok Food Tours offers several other tours, including Chinatown, Ayutthaya, and for those adventurous types, Bizarre Food Challenge! Definitely, a must when visiting Bangkok. Be sure to check out their sister companies when traveling to Chiang Mai, Phuket, and Singapore. The Beer-Centric Traveler writes for Play Harder Tours… Please email Bill@playhardertours.com and start your travel planning today! For a complete list of recommendations please email with ” Bangkok Food Tours ” on the subject line. I’d love to hear your suggestions too.